Force-feeding is the practice of feeding a human or other animal against their will. … Force-feeding is also known as gavage, from a French word meaning “to gorge”. This term specifically refers to force-feeding of ducks or geese [with a grain mash] in order to fatten their livers in the production of foie gras. And then food-source hypallage (like grass-fed beef: it’s the cattle that are fed grass, not the beef from the cattle), as in a section of my 12/6/18 posting “O happy day! Annals of hypallage 2018”. This entry was posted on December 10, 2018 at 6:01 pm and is filed under Hypallage, Language and food, Linguistics in the comics. You can follow any responses to this entry through the RSS 2.0 feed. You can leave a response, or trackback from your own site. 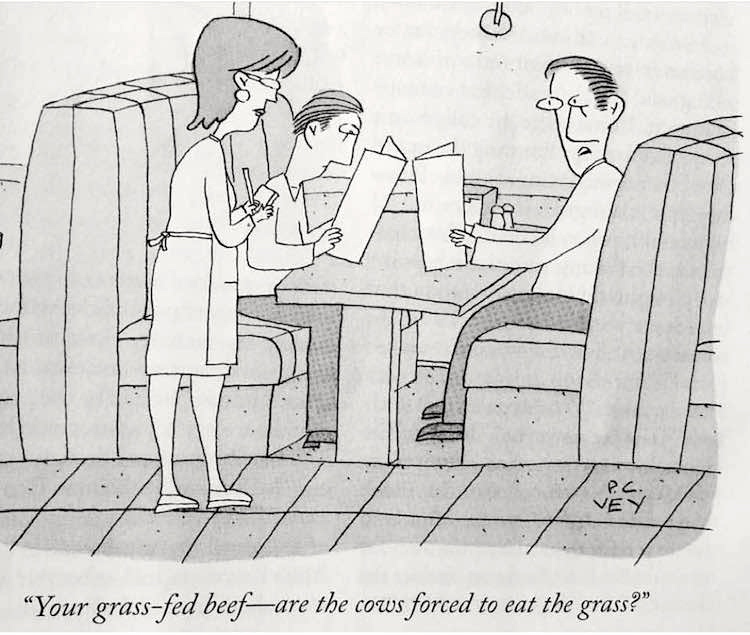 Ah, but a beef is a (male or female) cow, considered as a source of meat. They do not become beeves only once butchered. And, of course, gavage, or whatever it is the questioner has in mind, is hardly practical with grass.